Upgrade your kit with new heads. The Evans EMAD 5-Piece Drumhead Pack includes a set of 12"/13"/16" G2 clear tom heads, a 14" SD Dry snare head and a 22" EMAD bass drum head. The G2 tom heads are double-plied for a full, meaty tone that combines a satisfying blend of attack and warmth, plus they're very durable. The SD Dry 14" coated snare head provides all the articulation and dynamics of a single-ply head, while controlling overtones and offering the durability of a double-ply drumhead. The now legendary EMAD bass drum head has become the standard for both studio and live performance. 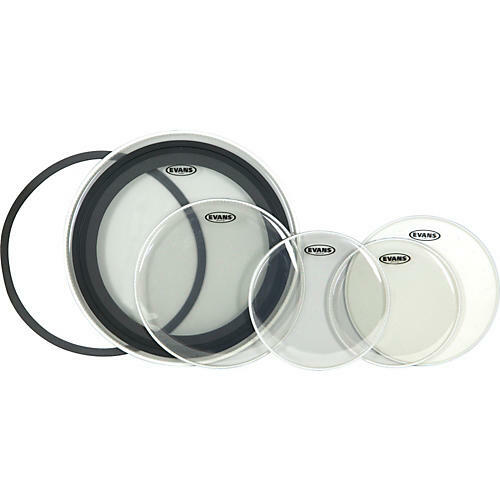 Its unique active dampening system allows you to control the desired amount of overtones from your drum throne by adjusting the batter side external tone ring. Simply remove the ring for more overtones (a more "live" sound) or keep it in for a more thuddy bass drum timbre. Freshen up your kit sound. Order today.